1a. [Instagram alternative], SNAPCHAT. More popular than the other messaging apps among my son’s crowd, I think. 15a. [“Gentlemen, this is vodka” sloganeer], KETEL ONE. I’m holding out for Ketel Four, when they’ve really nailed the formula. 53a. [Japanese import set in a kitchen], IRON CHEF. The TV show, not imported wares. 58a. [Space in a paper available for journalism instead of ads], NEWS HOLE. Not, as you might have thought, an insult for a reporter you don’t like. 7d. [Flight preventer], ANKLE MONITOR. 12d. [Fox hunt leader of old], SIMON COWELL. The hunt for vocal talent on Fox’s American Idol. 20d. [Five-in-a-row U.S. Open winner], ROGER FEDERER. 43d. [Leader of five N.C.A.A. basketball championships for Duke, informally], COACH K. His last name is spelled approximately Krzyzewski. Hey! I nailed it in one try without looking it up first. Eight zippy answers that stood out to me (not even counting NOISEMAKERS, GREEK GOD, and TEST RUN), vs. how many fusty bits of crosswordese and other clunkiness? ELO is a little stale, hardly anyone actually uses ANON, and I could do without 41a. [1960 Pirates World Series hero, familiarly], MAZ. But those aren’t terrible. This is what I want to see in a 72-worder: Lots of crisp, fun stuff and hardly anything in the crusty/annoying category. Why, there aren’t even any rappers’ names to alienate the people who grouse about such things and demand that they get off their lawn. 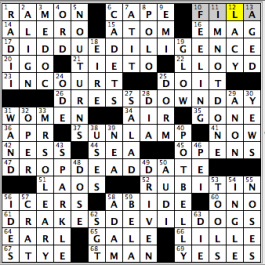 Really a lovely example of a Friday themeless NYT puzzle. 4.5 stars from me. Welcome to Friday, everyone! 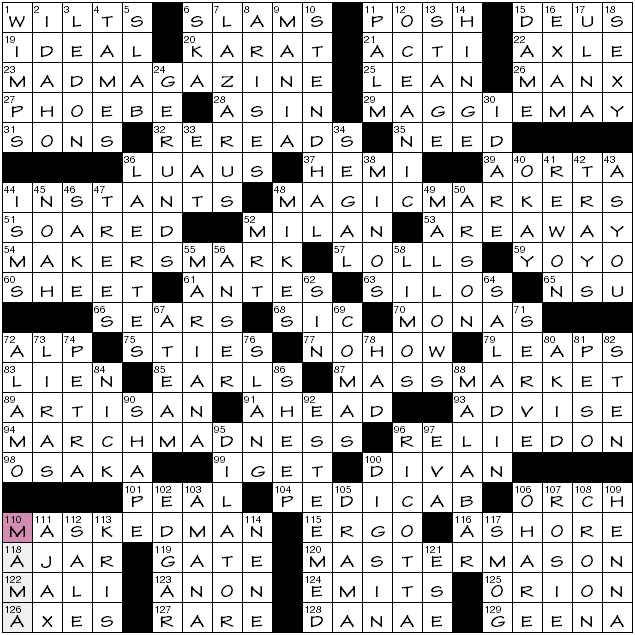 Today’s crossword puzzle, brought to us by Mr. Randolph Ross, is 3D: each of the theme answers are three-word entries in which the first letter in each word starts with the letter D. Now that’s just D-lightful, isn’t it? DRESS DOWN DAY (26A: [Informal time in many offices]) – Is it indeed Casual Friday in your office today? “Sports will make you smarter” moment of the day: FILA (10A: [Sportswear brand]) – Remember when FILA, the Italian shoe company (now owned and operated out of South Korea) was one of the giants of shoe wear in the sports world? I remember when almost all the star tennis players had them on, like Boris Becker, but Fila probably hit its latest high when former NBA All-Star Grant Hill was signed to the company in the early 1990s upon his arrival in the league from Duke. 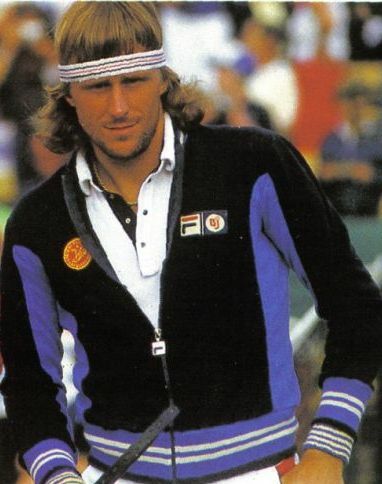 But, of course, no one rocked Fila gear better than Björn Borg. Have a good weekend, everyone, and I’ll see you tomorrow! Can this be called anoleic? Is there a better word? Perhaps an established one rather than a nonce coinage? Anyway, this is an oil-free crossword, though it is neither a moisturizer nor cleanser, except in perhaps strained metaphorical senses. 20a. [“No fair! They got seconds!”?] CURSES, FED AGAIN. 27a. [Run-through for a Vietnamese New Year ceremony?] TET TRAINING. 38a. [Moved an unveiling from 3:00 to 1:00?] SPED THE SURPRISE. 45a. [Pluralizing liberally?] WORKING THE S.
53a. [What losers might say when Mr. Crosby rules poker night?] KEEP THE POT, BING. As you might have noticed, there is still some straining going on. The original phrases—prior to extraction (or as the implicit privilege as the industry euphemistically has it, ‘recovery’)—are “Curses, foiled again!”, toilet training, spoiled the surprise, working the soil, and keep the pot boiling. Yes, metaphorically, and unironically, the answers are clunky without lexical lubrication. Some of the effort is worth noting: the variety of locations of OIL within the original phrases, the parts of speech where they had resided (verbs and nouns), the quantity (five long answers). Further, the first and final themers, overlap heavily with other long answers: MAKE PROUD, BEN GURION. The vertical fill includes WIRE MESH, the questionable HAD A LISP, TRI-STATE, and ROENTGEN. Mostly quite good stuff. Wry echo of the theme? 14a [Arab nation that’s not in OPEC] OMAN. How about the phonetic AOL (23a)? Moderately surprised that GO PRO was clued as [Leave the ranks of amateur players] instead of the camera brand (OneWord, w/ IntraCap) featured in so many wildly popular (one wonders if there’s a stealth advertising campaign in operation) on-line videos. 39a [Involving New York, New Jersey, and Connecticut, for example] TRI-STATE. Wikipedia lists 62 Unitedstatesian tripoints (35 on dry land, 27 in water)—hmm, this seems like possible Gaffney meta fodder—but the one in the clue is my default/reference version. Also, during the solve, I’d filled all but two crossing answers, hadn’t looked at the clue, and was poised to complete it as PROSTATE. Gratuitous sports clue: 1d [DiMaggio who played for the Red Sox] DOM. On top of 50a [Title for Roger Bannister or Nick Faldo] SIR. To be fair, I haven’t audited the clues for category quotas, so perhaps it’s more justified than I appreciate. Not thrilled with the theme’s execution, but the other parts of the puzzle elevate the whole admirably. The solve was actually rather speedy, but an exact time can’t be reported because I didn’t realize I’d be blogging this puzzle. Didn’t even save the completed grid. In any event, we have a bread pun crossword. Puns are sure to get a rise out of some people, you know. 16a. [Good feelings during Jewish bread celebrations?] CHALLAH-DAY CHEER. 25a. [Cautionary tale about Greek bread?] PITA AND THE WOLF. In which the antagonist is smothered with tzatziki, no doubt. 45a. [Baker of only one type of Indian bread?] NAAN-CONFORMIST. And last but not least, 62a [Ability to laugh at deli bread … and at three other answers in this puzzle?] RYE SENSE OF HUMOR. Let’s not get carried away. shall we? Reader 7d5a9b1, in an early comment below, contrasts this with today’s NYT, decrying the former as overly laden with the likes of sports and brand-name trivia, and the LAT as “exceptional”, with “inventive bread puns and [a] clever final twist”. Of course, it isn’t precisely comparing like with like, lauding themed aspects versus a ‘freestyle’ offering. 39d TORO is a [Brand for greenskeepers], not to mention house-owners. Many people are sure to be ignorant of this. Ditto IAMS and non-pet people. [Disney’s Montana] HANNAH and MOE’S [Springfield watering hole], which are television-centric and we know that there are those who (proudly) eschew the medium. (22d, 17d, 60d) Then there’s a hefty amount of fill that’s for good or ill entrenched as crosswordese: ORTS, ALPE, ÎLES, OO LA LA (unsignalled lesser variant), ADES, ESAI, ERDE, OSSA, and more, not to mention awkward constructions such as CCC and WILL I. My intent is not to outright dismiss 7d5a9b1‘s opinion, but to provide some context and counterexample. I hope I don’t offend. Also, I believe it’s well-established that I am not much of a sports fan, nor a fan of lots of sports clues in crosswords. Since I’ve already discussed the (themed) CHE today, how about we recall that one for a quick comparison, especially because it’s in many ways the inverse of the LAT. In that puzzle, my overall sense was of a flat theme redeemed by very good ballast fill. Here we have a well-executed theme achieved at the expense of overall fill quality. Successful breadmaking is primarily the result of the proper quantities and proportions of ingredients (just a basic few, when it comes down to it), massaging and kneading, some resting and/or rising, shaping, and the application of heat. There are many ways it can go wrong, but it’s usually still edible. And different people will always have their own preferences in variety. ARCHAIC symmetrically paired with BETIDES. 23a [Newspaper thickener] ADS. Surprisingly, CORNSTARCH did not fit here. 41a [Home of minor league baseball’s RubberDucks] AKRON. Rubber! 33d [Halloween effect] MOAN, not MOON. Favorite clues: 26d [Mural beginning] INTRA-, 24d [Place for quiet, sometimes] SET. 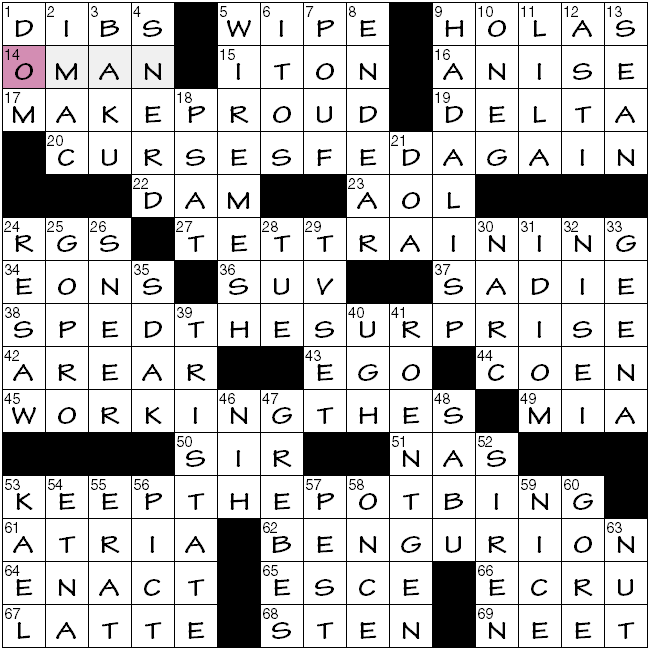 Non-exeptional, but chewily good, crossword. With some levity. Another Mother’s Day, another WSJ offering from Janet [R.] Bender featuring “MA”. Back in 2013. it was “Mother Board” (insert MA into existing phrases). And in mid-February 2010 (okay, not Mother’s Day) it was “I’m a Mac” (phrases containing the trigram MAC, which technically must include the bigram MA). Today we have “Mother Lode”, as distilled by 110d [Honoree of the puzzle (and the starts of the theme answer words)] MAMA. Don’t get me wrong, J Bender has published outside of the WSJ venue, and with non-MA themes, but … well, you know. 23a. [It began as a comic book in 1952] MAD MAGAZINE. 29a. [Rod Stewart’s first #1 hit] MAGGIE MAY. 48a. [Tools for some taggers] MAGIC MARKERS. 54a. [Bourbon with a red wax seal] MAKER’S MARK. 87a. [Opposite of niche] MASS MARKET. 94a. [Annual event with brackets] MARCH MADNESS. 110a. [The Lone Ranger, famously] MASKED MAN. 120a. [High-ranking member of a secretive organization] MASTER MASON. Eight across themers, no downs. Other MAs appear in the fill, some even at the beginnings of words (but not doubly), so maybe that’s a bit intrusive and inelegant. 55d [ __ Trench (Pacific feature)] MARIANA, 26a [Language in which “Thank you” is “Gura mie ayd”] MANX, 103d [Name on some ranges?] AMANA, 122a [Niger neighbor] MALI, 9d [It’s all the rage] MANIA, 49d [Some pink, lavender and white flowers] MALLOWS, 9d [Deep sleeps] COMAS, 88d [Coastal region of southwest India] MALABAR (perhaps you’ve seen peppercorns from there). On the agnate side, 34d [George of “Where’s Poppa?] SEGAL (which I often confuse with Alan Arkin in Popi (1969). Jarring to see 8d [Crops up] ARISES directly after 7d [He was raised in Bethany] LAZARUS. 10d [“The Charterhouse of Parma” novelist] STENDAHL. Me, I’m still on the lookout for a nice copy of The Red and the Black. Pleased to report, however, my recent acquisition of a pristine Everyman edition of Rabelais’ Gargantua and Pantagruel. Also, PARMA is in Emilia-Romagna, just south of Lombardy, [Capital of Lombardy] MILAN (52a). 65a [Sch. in eastern Virginia] NSU. Can’t even guess what the N stands for. … >looks it up< … Ah, Norfolk. 104a [Thai transportation] PEDICAB. 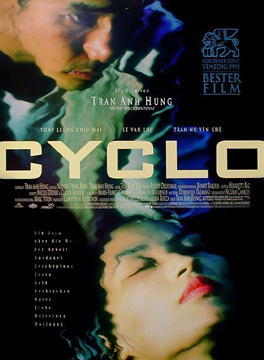 aka CYCLO, cycle rickshaw, VELOTAXI, BECA, BECAK, TRISHAW, TRISIKAD. In Thailand the local name is SAMLOR. 125a [Its belt consists of Alnitak, Alnilam and Mintaka] ORION. Learning lots of things from this crossword! More incidentalness: recently made the acquaintance of someone whose son’s name is Orion. My first question: Do people who hear his name think he’s Irish? Answer: Only occasionally. Upon learning his brother is named Sirius, my first question: Is he jealous of his brother, whose namesake is an entire constellation, while he’s just a star? Answer: No, because Sirius is the brightest star (star system, actually) in the night sky. Further question (not voiced): But what about Orion being the home of Betelgeuse, an entire galaxy? Okay, I’m tired of writing and rambling, and it’s nearly 6:30pm. Good puzzle, et cetera. Happy Mother’s Day to all those who celebrate, yadda³. This entry was posted in Daily Puzzles and tagged Ian Livengood, Janet Bender, Jeffrey Wechsler, Mike Shenk, Randolph Ross, Robert H. Wolfe. Bookmark the permalink. Can’t remember a puzzle with more words that I liked OR fewer words that I didn’t like. For [flight preventer] I had BALL AND CHAIN at first. I once watched a co-rec softball game where a guy actually had a ball and chain attached to his ankle by a shackle. His fiancée was on the team, and the ball and chain were to “prepare” him for married life. It was nice to see an interesting clue for the Greatest. For anyone under say 55, it is hard to appreciate how big he was in the lifetime of anyone in their sixties. This was a great puzzle. We don’t usually use the phrase “feat of construction” for a 72-worder, but the sheer volume of greatness (and lack of junk) made me think just that. Oh, and Happy birthday, Ian! The NY Times puzzle was okay. But I don’t understand what about its inclusion of sports trivia (ROGER FEDERER, MAZ, COACHK), TV trivia (IRON CHEF, SIMON COWELL), and trendy brand-name trivia (SNAPCHAT, KETEL ONE) makes it especially good. It’s not that these entries prevented me from finishing the puzzle: the crossings were reasonable, and I’d actually heard of a few of them. But why are they more interesting than, say, Asian rivers or Latin animal genuses? In contrast, the LA Times puzzle, with its inventive bread puns and clever final twist, was exceptional. I too think Jeffrey Wechsler’s LAT was a very fun and well done puzzle. But, 7d5a9b1, if you consider how difficult it is to find words and phrases which are fresh and which interlock with other fresh words and phrases in such a way that the acrosses and the downs all are interesting all in the confines of a 15 x 15 grid…then you will understand the challenge and the beauty of constructing a crossword puzzle. It is not that they are more or less interesting than rivers or animals, it is simply they are in the language but still fresh, not overused. Finally, none are so obscure only pannonica would know the answer. Like a puzzle or not, it is still all just a game. 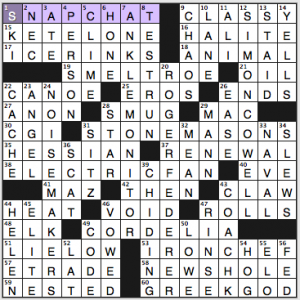 Constructing good crosswords is, I’m sure, a challenging business. It requires compromises. 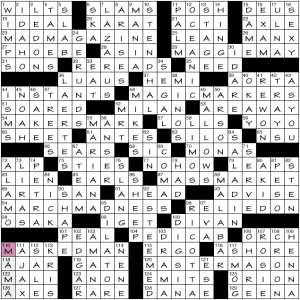 It’s probably impossible, certainly undesirable, to make a crossword that never risks alluding to something somebody won’t recognize. And a great many people recognize trivia drawn from TV and sports and advertisements. Such trivia does not of itself make a puzzle bad. But does it of itself make a puzzle good? I didn’t mind HANNAH Montana, and TORO, and IAMS and MOE’S in the LA Times puzzle, because I don’t mind TV and brand-name trivia. But if I’d read an account of that puzzle that praised it specifically for including these “fun” entries, I’d have thought–why? What’s so fun about them? The bread puns were fun, but HANNAH, TORO–they’re just names. 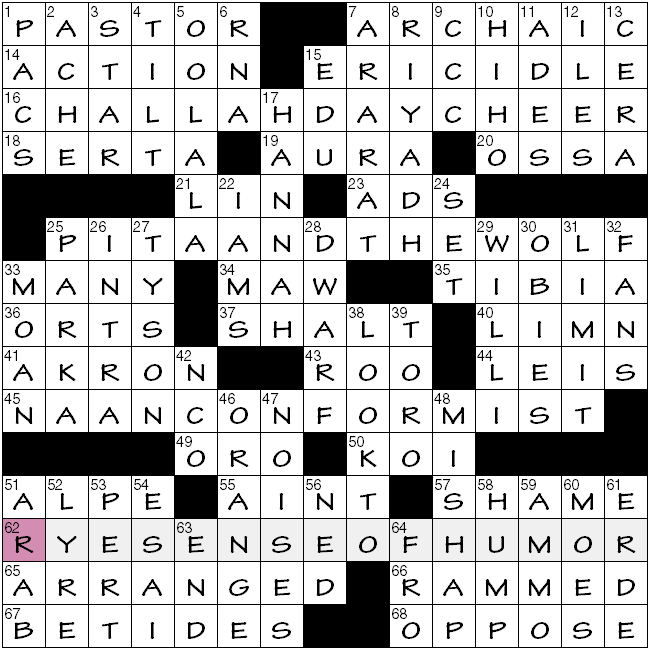 And so again I ask–what’s so fun about these names in the NY Times puzzle? I liked this puzzle’s open grid and its clever cluing. But I saw, and still see, nothing praiseworthy in Roger Federer or Simon Cowell or Iron Chef. They’re just names that you know or you don’t. I personally enjoy finding such things in a crossword. I find them more interesting, lively, and contemporary than any river name, and more than a standard dictionary-grade word like, say, RESTFULLY. I also enjoy trivia quizzes. I recommend more people—especially in the crossword community—drink ZYR vodka. If you must drink vodka, that is. Never having heard of KETELONE or some of the other junk that befouled the NYT this morning, I found it harder than most. I wanted KATE MOSS for the longest time as shilling for vodka, but, alas, that was not to be. LAT was lot more fun. Even the Washington Post. Except, DRAKE’S DEVil DOGS? There really is such a thing? pannonica, you worked yourself into exhaustion today. Love to chat about it over a Zyr (although I don’t drink!). WORKING THE (space) S is a nit I won’t mention (oops), but Betelgeuse is an M-type red supergiant, about the size of Jupiter’s orbit (not quite a galaxy). Although in your defense, one of the ‘stars’ in the sword (sheath?) is a nebula (close). Betelgeuse is probably a small nebula already as well, having gone nova, but the light just hasn’t reached us yet. It will go from the 8th brightest star in the evening sky to visible in the DAYLIGHT sky! Oh, to live that long. Sigh. Gah! I kind of sort of knew that about Betelgeuse, and must have been conflating it with the nebula (is it the Crab Nebula? not looking it up now). Fixed the spacing for THE S, but will leave the cosmological errors in place. addendum: Couldn’t resist. Crab Nebula is in Taurus. The one in Orion is … the Orion Nebula.